I don’t know whether you’re one of those super-fans that immerse yourself in historical dramas? I like historical fiction and I love Downton; the contents of Lady Mary Crawley’s wardrobe would look pretty good in my house. Anyway, last week, I felt as though I’d fallen through the rabbit hole into a wonderful, opulent world of days gone by – in Trafalgar Square, of all places! I was lucky enough to be invited to attend an elegant dinner party at a bank that was so posh it had crystal chandeliers in the banking hall and a doorbell. Drummonds Bank is a 300-year-old establishment in Trafalgar Square where the Queen Mother conducted her banking transactions in a private dining room over a Victorian carafe of gin. It’s where you’d expect to see the father from Mary Poppins taking tea with his employers floating above the cashiers. It was a magical place. And I was there. Dripping my red wine on a £200,000 Adam table displaying a guest book with the Royal family’s signatures. Who knew?! A wonderful prospective client of mine invited 14 guests to share the evening around a dining table laid with hand carved hallmarked silver, sparkling crystal ware and the most perfect sirloins. The host provided some of the funniest stories and anecdotes I’ve heard for a very long time, and I’m tempted to steal them for my (one-day-soon-to-be written) book! And if it makes good royalties, what a lovely home this would be for my money to grow! I met some fantastic people that night, some of whom use social media effectively for their businesses and some who don’t. Yet. One business that does use it very nicely is my accountants, Nordens. So this week I was really, really happy to celebrate with them following their two fantastic wins at the British Accountancy Awards. They’re a fantastic firm and thoroughly deserving of their awards for Independent Firm of the Year (East England) and New Accountant of the Year (UK). 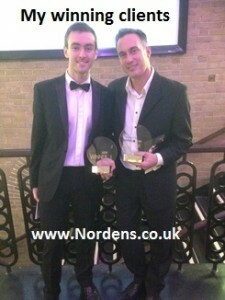 I may be a bit biased about their award-winning applications though, as I wrote them… My copywriting aside, Nordens provides a business service that goes way beyond boring accountancy. They help people to live their dreams and make the money they deserve. And who doesn’t like the sound of that?? If you’d like to live your dreams and make the money you deserve, let’s have a chat. As Stevie reminds us, “You say you want your freedom; well who am I to keep you down? It’s only right that you should play the way you feel it … Have you any dreams you’d like to sell?” Well, have you? You can tell me about them here: @WeekendWitch.